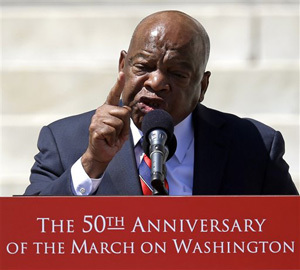 WASHINGTON (AP) – Marchers who gathered in the nation's capital vow to renew the fight for Civil Rights for those areas of equality yet to be attained as well as address the erosion of equal rights in other areas. Tens of thousands of marchers kicked off the 50th anniversary commemorations of the March on Washington, honoring the civil rights progress made since Martin Luther King Jr. delivered his "I have a Dream" speech, while lamenting what they called new attacks on racial and social equality. Organizers of Saturday's march hoped the anniversary would serve to inspire people again to educate themselves about issues they see as making up the modern civil rights struggle. The Aug. 28, 1963 March on Washington drew some 250,000 people to the National Mall, ushered in the idea of massive, nonviolent demonstrations and helped bring about the 1964 Civil Rights Act. The event Saturday was the precursor to the actual anniversary of the march. On the day of the anniversary, President Barack Obama, America's first black president, will speak from the steps of the Lincoln Memorial, the same place King stood when he delivered his stirring speech. On Saturday, Eric Holder, the nation's first black attorney general, thanked those who marched a half century earlier. He said he would not be in office, nor would Obama be president, without them. "They marched in spite of animosity, oppression and brutality because they believed in the greatness of what this nation could become and despaired of the founding promises not kept," Holder said. Holder said the spirit of the 1963 march now demands equality for gays, Latinos, women, the disabled and others. Keeping with that theme, those in attendance represented a grab-bag of causes advocating gay rights, organized labor and voting rights. Congressman John Lewis, who was severely beaten in the 1960s while marching for voting rights, denounced a Supreme Court ruling in June that effectively erased the most powerful part of the 1965 Voting Rights Act, whose enactment marked a major turning point in black Americans' struggle for equality. "I am not going to stand by and let the Supreme Court let the right to take our right to vote from us," Lewis said. "I'm not tired. I'm not weary I'm not prepared to sit down and give up." The Supreme Court argued that the provision - which had required states with a history of discrimination in voting to get federal approval before changing the way they hold elections - relied on 40-year-old data that does not account for racial progress. The ruling has unleashed a string of restrictive voting laws and rules in several states. Other activists cited persistent unemployment among African-Americans, which is about double that of white Americans, and the Florida shooting death of unarmed black teenage Trayvon Martin and the acquittal of his killer, George Zimmerman. A jury found Zimmerman acted in self-defense. "It's very difficult to stomach the fact that Trayvon wasn't committing any crime. He was on his way home from the store," Sybrina Fulton, Trayvon's mother, said Friday as she prepared to participate in the march. "Don't wait until something happens to your child. … This is the time to act now." Saturday's event was being led by the Rev. Al Sharpton and King's son Martin Luther King III. After several speeches, participants will walk the half-mile from the Lincoln Memorial to the 2-year-old memorial. On Friday, a coalition of black leaders issued what they said is the 21st century agenda for the nation. They named economic parity, equity in education, voting rights, health care access and criminal justice reform as national policy priorities. Alice Long, a NASA administrative assistant, traveled from Alabama with her grandchildren to give them a close-up view of African-American and civil rights history that she said isn't being taught in schools. "I'm here supporting this march because there are so many injustices in this country," Long, 59. "I'm very concerned about it because I have a 5-year-old grandson and a 13-year-old granddaughter."